The New Zealand government ordered the Soviet Union‘s ambassador, Vsevolod Sofinsky, to leave the country within 72 hours after he allegedly delivered money to the pro-Soviet Socialist Unity Party (SUP). Sofinsky’s expulsion resulted from an incident shortly before Christmas, when he met with SUP national secretary George Jackson at an Auckland motel. During the meeting, the Soviet ambassador supposedly handed over $10,000 (equivalent to nearly $50,000 today). New Zealand’s Security Intelligence Service, which had bugged the room, captured this transaction on tape. Although there was some doubt about Sofinsky’s precise role and both parties vehemently denied money had changed hands, Prime Minister Robert Muldoon felt there was sufficient evidence to expel the ambassador. 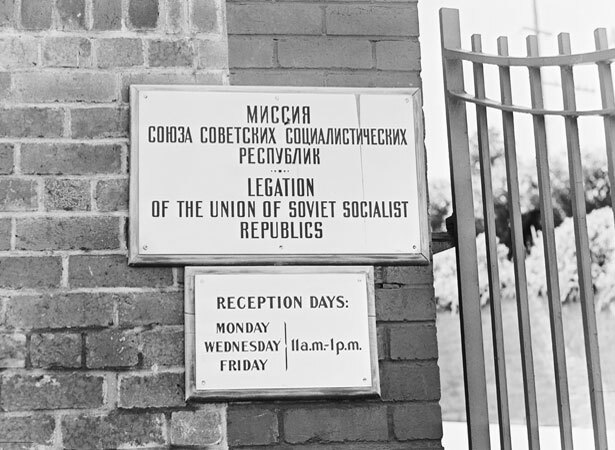 Despite fears that this move would derail New Zealand–USSR trade relations, the superpower retaliated merely by expelling New Zealand’s ambassador to Moscow. The countries re-established formal diplomatic relations in 1984. We have 1 biography, 2 articles, related to Soviet ambassador expelled.